When the Packard Clipper returned in 1953 after a five year absence, it replaced the entry-level 200, and joined the Cavalier, Mayfair, Caribbean, and Patrician. The Clipper line was divided into standard and Deluxe trims, with the former carrying a 288-cid, 150-hp straight-eight, and the latter being equipped with a 160-hp, 327-cid eight-cylinder engine. The Deluxe also carried more upscale trim and convenience features. A two-door club sedan and a four-door sedan were available as either standard or Deluxe models, while a Sportster coupe could be ordered to standard spec. Prices ranged from $2,500 to $2,800, and more than 60,000 were built. The Packard Clipper line remained mostly unchanged for 1954, and sales dipped to 30,000 as most other manufacturers rolled out revised models. Horsepower on the 327 did increase to 165, and the Sportster coupe became a Deluxe model. A Super line was also added to the Clipper, which included more exterior brightwork and interior luxury items. Lastly, a Panama hardtop was added to the Packard Clipper line, and it instantly became the most expensive Clipper model at $3,100. 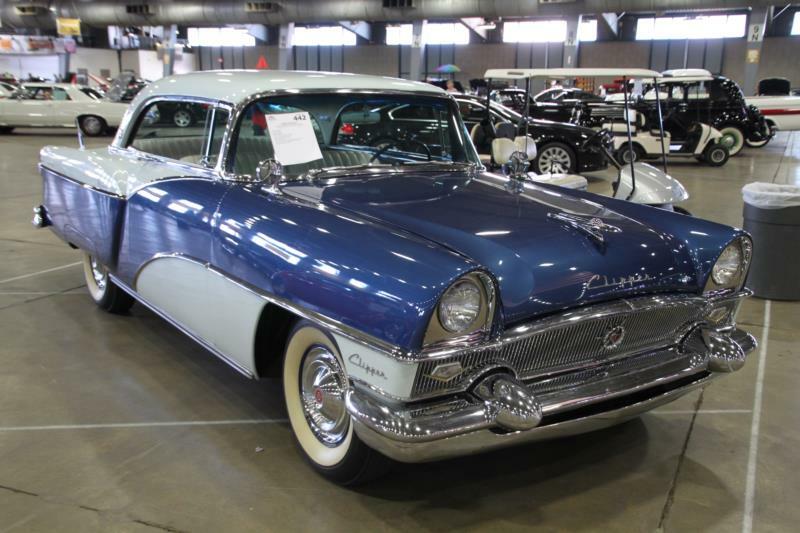 Packard significantly altered the Clipper line in 1955 with a new design, new powertrain, and a new chassis. The car’s front was radically different, with a mesh grille, revised bumper, and a wraparound windshield. Mechanically, a 12-volt electrical system was adopted, a new torsion bar suspension was installed, the Ultramatic transmission was enhanced, and a V-8 replaced the straight-eight engines. Deluxe, Super, and Custom trims defined the Clipper line, with the first two carrying a 225-hp, 320-cid V-8 with two-barrel carburation, and the latter using a 245-hp, 352-cid V-8. A Custom version of the Panama hardtop joined the ranks, and was called the Constellation. Sales plummeted in 1956 after problems with the new V-8 and the torsion bar suspension were reported, and only 29,000 cars were sold. Base lines were the Clipper Deluxe and Super, while the Custom gained an Executive sub-series. The Deluxe and Super had a 240-hp, 352-cid V-8, while the Custom sported a 275-hp version of the same engine. Financial strain whittled the Packard lineup down to only the Clipper name in 1957, and was essentially a Studebaker President. Fewer than 5,000 cars were sold in two body styles: a four-door sedan and a four-door station wagon. The same situation recurred in 1958 with a wholly new design, only the models were now simply called Packards. By the end of the year, Packard had manufactured its last car. The Clipper is an interesting line to follow, with some postwar cars at the very top of Packard quality. The 1955 and 1956 cars are particularly handsome, and usually carried bright “Easter egg” colors. Trim can be hard to find, though, and the torsion-bar suspension can sometimes be a problem. A common alteration for 1955 models is to upgrade the engine to 1956 specifications, which can be desirable.